I have a soft spot for handmade accessories especially beautiful hair bows and jewelry. There is always such passion and talent put into each piece and the offerings at Loove and Sweet are an excellent example because everything that is created is so pretty and top notch quality too. 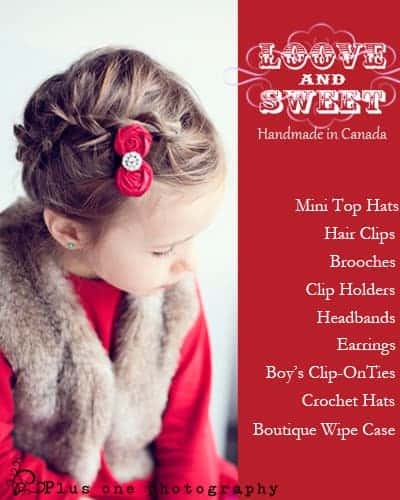 Specializing in handmade bows, crochet hats, headbands, flower clips, tutus, brooches and the most beautiful earrings, Loove and Sweet has something amazing for women and girls of all ages. I fell in love instantly with the Nana II Collection earrings! These feminine, delicate (yet sturdy) earrings are so unique and lovely with a red flower and mini-pearl inspired clusters in the center of the golden classic center. My favorite part is that these earrings are 2” wide by 2.5” tall yet it is still so lightweight and comfortable to wear unlike most large style earrings I have worn in the past. At $15 per pair, these earrings are the perfect gift idea and I highly recommend picking up a pair for yourself too because I am confident that you won’t want to part with it when you see the detailing up close. The Christmas Collection includes Holiday Bows for women and girls that are really pretty too. The large red and gold bow that I received is so pretty in my daughter’s hair and the shiny gold color really makes it “pop”. It is available as a bow or you can add it to a headband. The Christmas Flower Clips and Brooches can be worn in many different stylish ways including clipped in your hair, attached to your purse, accentuate your scarf or worn as a brooch. The details and embellishments are so lovely and you can purchase yours for only $14 which is an excellent value in my opinion for this piece. I am very pleased with the beautiful accessories that I received from Loove and Sweet. I appreciate that this is a small mom owned business and she is very talented! You are invited to visit the Loove and Sweet online shop in order to purchase any of the items featured here or to pick your own favorites….there is a ton of beautiful hand crafted items available so have fun shopping. Check out the low shipping prices too! To do the daily tweet: If the form will not let you put in your daily tweet, please fill out the main entry again and put “Do Not Count” in the Extra Info, Name or Email box. Then it should let you complete the daily tweet. I would love to have the bowties in the Oliver Collections. Thanks for the giveaway! I would love to have the Sweet Amy Brooch. I love the miss mia hat! I LOVE the Chloe Mini Top Hat Collection 1!! Too cute! I like the Ella headband. Super Cute!! I like the Christmas Collection! Happy holidays! Thanks so much for the fantastic giveaway! My oldest just cut her hair super short and would love the Hanna clips for it – they would look SO cute! I love the earrings in the Nana Collection! I like the nana collection earrings. I love the Chloe Mini Top Hat Collection 1, it’s soooo cute! Love the Sweet Amy hairband! I love the Ethan hat. I love the sweet melissa. Animal print is amazing, and they did wonders! I like the Oliver Collections clip-on bow ties for boys! I forgot to enter my twitter link for my tweet! Sorry about that! I love the nana collection earrings. I love the sweet melissa bow.